This Glacier Bay single bowl kitchen sink is made of composite granite and is silver in colour. This sink is 21 inches wide and is chip, scratch and stain resistant. Mounting hardware is included for an easy drop-in installation, and features up to 3 knock-out holes for flexibility when placing faucets, soap dispensers, side sprays, etc. Strainer is also included. 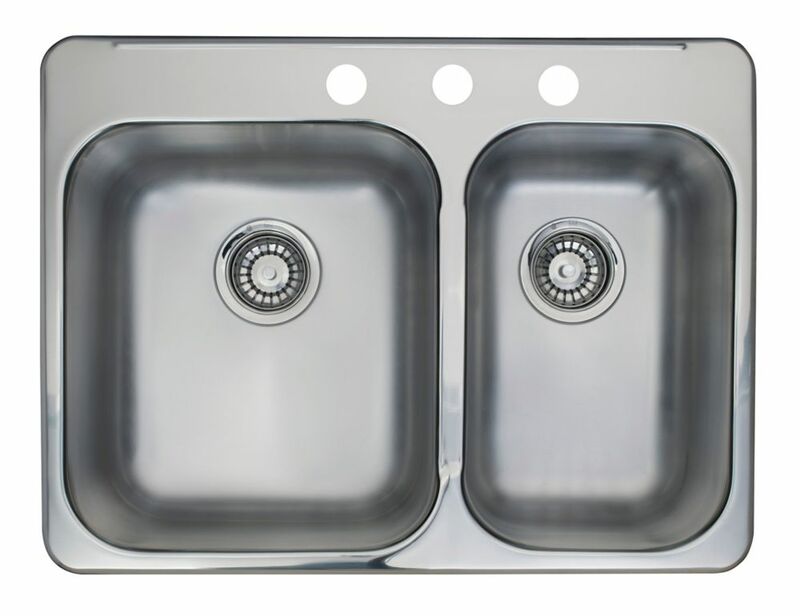 Combination Bowl Pre-Drilled 3-Hole Double Sink Combination bowl 20 gauge stainless steel top mount sink. Small bowl, right hand position. Includes faucet ledge with 3 one faucet hole drilling. Rear drains to allow for more storage below, easy care satin finished bowls . Sink is shipped complete with and waste fittings and is backed with a Limited Lifetime Warranty. Combination Bowl Pre-Drilled 3-Hole Double Sink is rated 1.0 out of 5 by 1.